These are just about the cutest rugs EVER! I know they are bathroom rugs, but I have put them in my lanai area. They govso well with my pink flamingo theme!! Bring a sense of luxury and elegance to your guest bathroom with the addition of this Modesto Bath Rug. 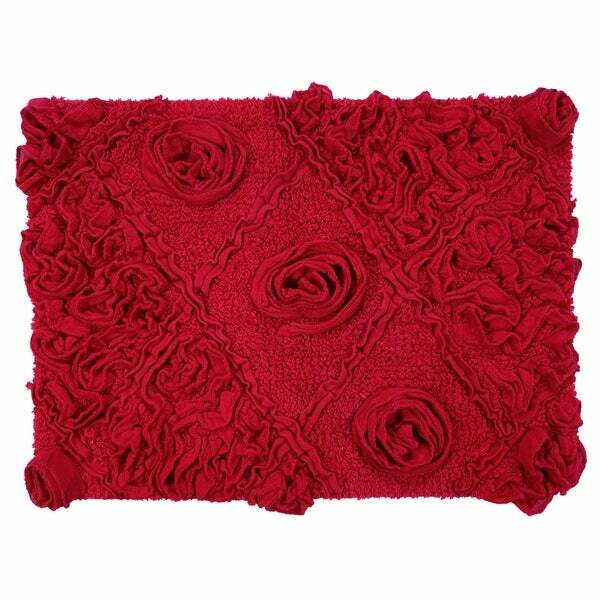 This stunning bath rug features subtle rose designs on bold solid colour background. Soft and durable, it is crafted from pure cotton for exceptional absorbency, thus helping to keep your floor dry after showers. The hand-tufted bath rug comes with a no-slip spray latex backing that helps keep your bath rug anchored to the floor as you step out of the shower or into the tub. Not only does it add comfort and style, but also a soft, absorbent and warm underfoot feel to your bathroom space. It is machine washable, making it easy to maintain. This bath rug is available in 5 different sizes and 6 lovely colours to match your bathroom style and décor. I love the golden yellow color & how soft this is under the feet. My half bath tile is so cold & this is just perfect . It has a lovely floral 3D pattern. Really happy with this purchase. This is just gorgeous, and feels so lovely under your feet. Very nice addition to the bathroom.